We have decided on our Auction schedule for April　2019　auction. from Monday April 15 from 12pm and Tuesday April 16 from 10am. This auction will have junbo tosai guarantee female and high class male tosai as well as other high class tosai. more pictures and videos in the coming days. Please have a look at them. We look forward to seeing everybody this April. This auction is a dealer auction. 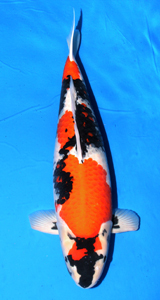 Hobbiests should contact a Momotaro Koi dealer for more information on bidding. We look forward to seeing everyone at our auction in April ! 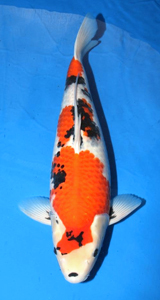 Auction Koi Please click on the link. 34rd All Japan Young Koi Show held in Himeji on 2017 March 11-12. Congratulations to all prize winners. 48th All Japan Koi Show At the All Japan Koi Show held in Tokyo on 2017 February4-5. In June of 2016, a Momotaro bred Koi won Male Champion at the Singapore 7th Annual “Nishikigoi Home of Asia” Koi Show. 33rd All Japan Young Koi Show held in Hiroshima on 2016 March 26-27. 51th ZNA International Koi Show. 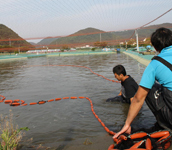 November 14-15, 2015　ZNA International Koi Show. We have started our first round of harvest for tosai culling. 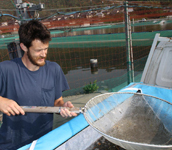 This year, our first season of breeding yielded 5,370,000 fry. From now on we will be culling everyday! First Round of Breeding finished. On May 12th, we finished releasing the hatched fry from our first round of breedings. The total for this first round is 5,370,000 fry. This year we are putting our best efforts into making as good Showa as possible. So far we have released 3,700,000 black fry from Showa breedings. Next month we will start culling, please keep checking back here for news. Click here to see pictures of our main Showa parent koi sets. one of our koi won the Young Champion Award. 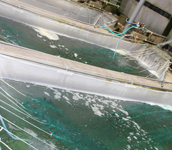 On April 20th we started our first breedings of the year here at Momotaro Koi Farm. On April 20th we began breeding for 2015. 46th annual koi show in Tokyo. At this show Momotaro Koi won many awards. Click here for details and pictures of prize winning koi. We have harvested many of our nisai now. So far this is our best nisai this year and maybe best one ever. This showa is 57cm and has a very good pattern with tsubo sumi. 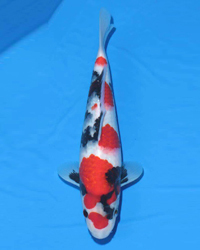 Baby of Black Dragon(KokuRyu) Nisai 57cm. We will enter this koi in our November auction. ※This koi is from the same parent set as Lion Queen, but is one year younger. We have finished releasing the fry from our second round of spawnings. We also made around 1,300,000 gin rin Kohaku fry. We are now starting our third round of breeding. We will try our best to make more and more great koi this season. 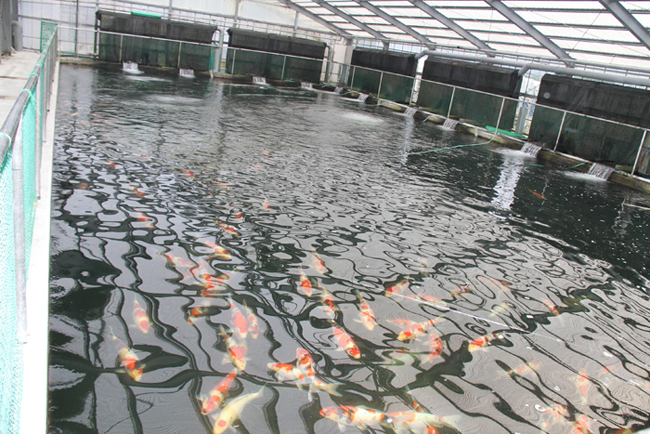 On April 19th we started our first breedings of the year here at Momotaro Koi Farm. From now on we continue to breed many sets of Sanke, Kohaku, and Showa everyday. We will continue updating on our breedings and progress throughout the year. Recently there was the Second Annual All Japan Jr. Koi Show held in Niigata. 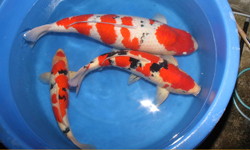 Momotaro bred Koi won 30 cm Best in Size as well as Best in size 36cm Showa. 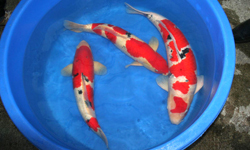 We are happy to get continued success in Koi shows throughout Japan and the world. celebrate winning our first Grand Champion Award, as well as other awards. 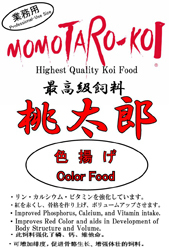 Momotaro Koi Original Koi Food. 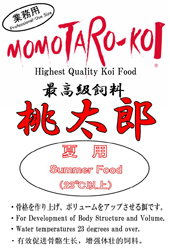 For the last 2 years we have been using our new original Momotaro Koi Food. 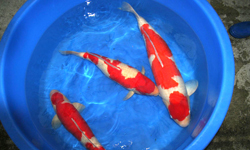 We can now see the great results in our koi and we can recommend with the highest confidence. We are nearing the end of the third round of breeding. In all we have made nearly 8 million black Showa fry. Combined we have made 10 million fry of Kohaku, Sanke, Gin Lin Kohaku so far. From the 20th of August we will begin our fourth and last round of breeding our final parent sets. After 2 rounds of breeding we have released 6,350,000 black Showa fry. Additionally, we have made 3,000,000 Kohaku and Sanke fry thus far. In our upcoming third round we will continue to make more and more Kohaku and Sanke fry. 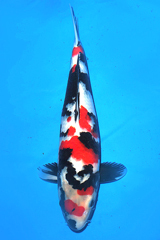 We have started our second round of breeding here with TM Kohaku…. one of our best parent kohaku. This year she produced 800,000 fry! From now on we will be harvesting the baby koi for the first culls. Everyday we will be harvesting and culling, then as the ponds open up, we will spawn more. In our first round of breeding we have made 3.5 million black fry from Showa parents. 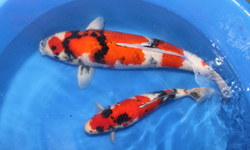 In our second round of breeding we will focus on Kohaku and Sanke while also making more and more Showa fry. 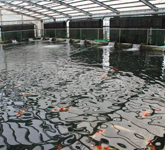 We hope to produce more than 6 million black Showa fry this year. 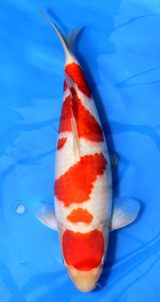 We would like to introduce you to our main Showa parent koi. Lion Queen won the Runner up Grand Champion award. of our best Showas for the Dream Koi Exhibition. 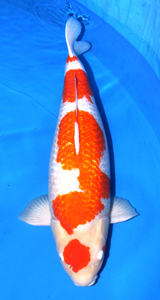 This koi is a 5 year old 90cm Showa named Red Tiger. This koi was very popular and received much praise from the koi show onlookers. 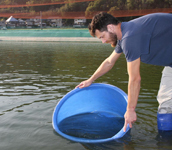 we released the black fry into the fry ponds for growing. 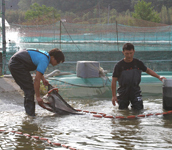 We start culling for keeping only black fry for Showa!! We start breeding from Mako Showa from 18th of April 2013!!!! We will update how are going!! a tosai showa from us won the Young Champion award. This koi was overall second best in the koi show. skillfully raised into show form. This Year we held our annual New Years tosai sale. We want to thank everyone for coming and making this event success. We have many tosai available for sale now and throughout the Spring. 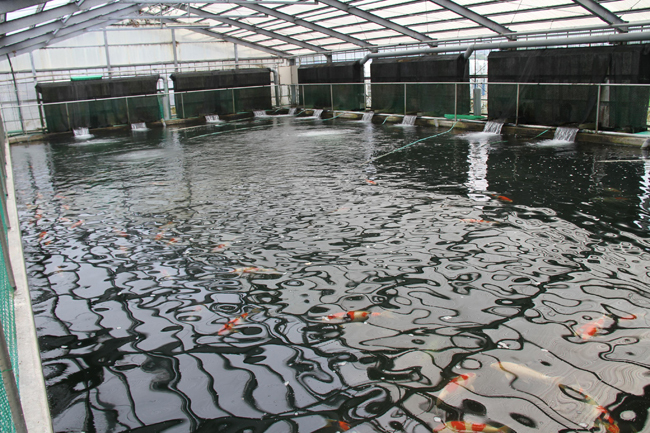 Here are some pictures of our 500 ton ponds here at Okayama Momotaro Koi Farm. and will be sold as nisai this coming fall and winter. 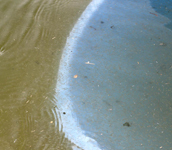 Our October 5th 2012 auction koi will be selected from these ponds. Please see the video as well. 517 flies for 1st round!! Momotaro Main Mud pond for keeping Tosai until to 2years old. Stared for the culling of 1st round!! We are now in the season of our first culling from our first round of breeding. 25th April 2012 breeding start!! We started breeding from end of April. Momotaro Mako Kouhaku Tosai Male 38bu won Young Champion!! 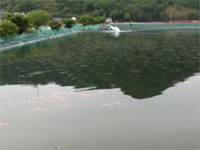 The 29th Young Koi show held on 21st and 22nd of April 2012. Momotaro Mako Kohaku male Tosai in 38bu won Young Champion!!! 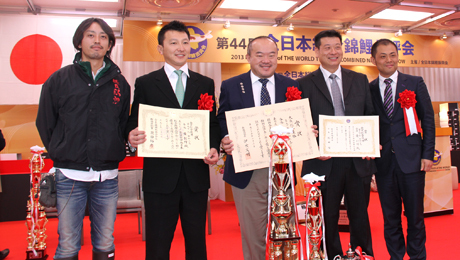 At the "2012 NISHIKIGOI of THE WORLD" Tokyo convention, Was awarded a number of awards. In an effort to better understand our Mako bloodline Showa, we would like to introduce this photo set of one of our best Showas produced here at Momotao Koi Farm. 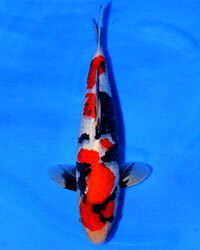 This koi was produced by pairing a Mako-line Kohaku female with our best Momotaro produced male Showa. This parent female Kohaku was selected for her outstanding body shape in hope that her offspring would resemble that bodytype but with Showa coloration. 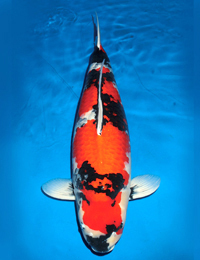 As a tosai this koi had one of the best red patterns as well as a standout, strong type of body. After her initial winter indoors she was released into a mudpond for raising for the summer. After harvesting and keeping in concrete for a month or 2. the first picture of her was taken as a 63cm two-year old. At this point her body was one of the best compared to her siblings and perhaps even the best of all the fish produced at the farm that year. Her red and white were also outstanding but showed the potential to develop further. Her sumi was very sparse but showed hints of its future positioning. She was entered into our winter auction that year as a nisai. The next year, 2010, this koi was kept in the 1500ton concrete pond all summer. She was a great eater growing to 77cms by the fall/winter of her third year. By this time her sumi had shown itself to be of good quality in addition to her great white and red coloration. The sumi pattern on the head developed very much as did the sumi between the second and third beni markings at her tail end. By this time we knew this fish had the pattern potential for serious koi shows throughout the world. kind of Showa we are trying to produce with the Mako Bloodline Showa - a Showa with a great body and greatly contrasting. long-lasting colors. 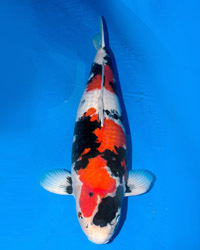 The 47th ZNA ALL Japan Koi Show held from on 11th to 13th of November 2011. 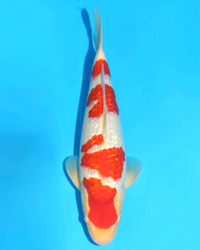 Momotaro koi won Mature Champion by Sanke 107cm!!! 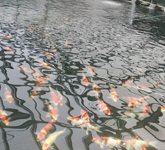 Throughout the koi world there are many generalizations regarding the main koi varieties. 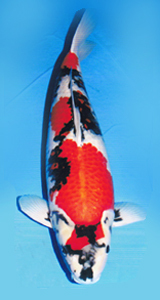 Many people would say that good specimens of Kohaku have the best bodies and the ability for a deeper but lasting red color(beni). Many would agree that Sanke can grow the longest and have the most elastic red. 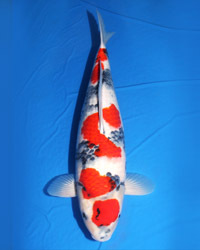 The generalization about Showa is that despite its striking colors, Showa often times lack the length and uniformity of its body to compete with the Sanke and Kohaku for the highest awards at the highest level. 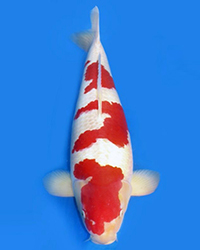 These generalizations have led us at Momotaro Koi Farm to strive to produce a new type of Showa, one with the growth ability and body lines of Sanke and Kohaku as well as an improved, even more dynamic black color(sumi). 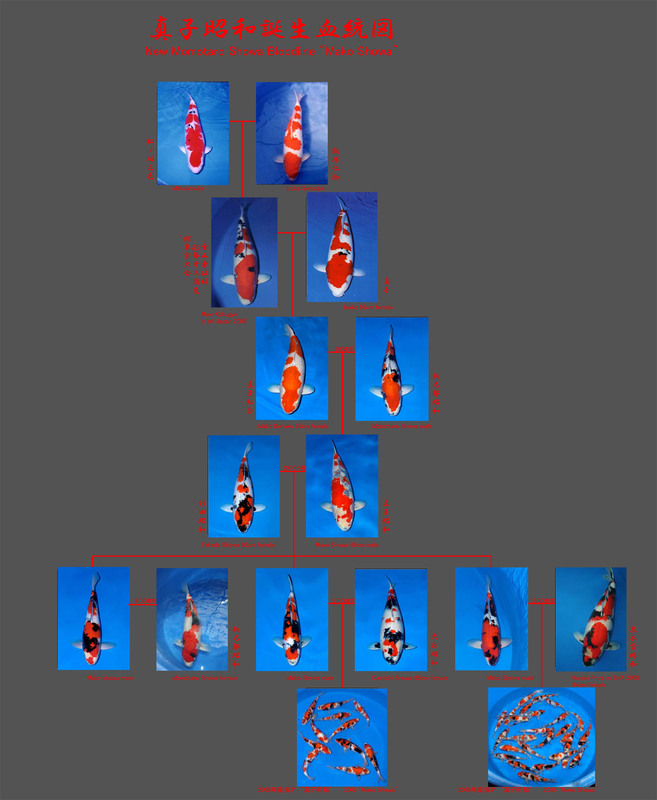 Since 2004, Momotaro Koi Farm has experimented with mixing the Kohaku and Sanke body traits into the Showa variety. What is the best way to do this? By starting with the best body base possible, we crossed a female Mako-bloodline Kohaku to one of our best male Showa. Mako was our main Sanke parent koi from a Matsunosuke Magoi Sanke parentage, so her daughter Kohaku has the genetics for growth and girth. From this initial spawning, the eggs and fry were few. After a summer of growing and intensive culling, only a few Showa from his crop remained. By the early summer of 2006 the best male Showa was used to spawn a Takeda-bred female Showa. At that time this male “Mako-Showa” showed the body characteristics we were hoping for, but the sumi was still very uninspiring. Now, in 2008 his sumi has remained unchanged but he has steadily grown in our male-greenhouse to 88cm. The 2006 spawn of this lone Mako-Showa male to the Takeda Female was step in the right direction. 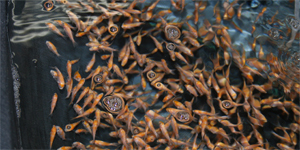 Although there were not many fry produced, there were enough to get an idea of the kind of koi this new type of Showa could produce. By the time we got to the last cull of that Autumn many of these were actually sold because we were unimpressed with the sumi. Only after a winter in the mudponds and another Spring-time cull did we see the potential of these koi. The remainder spent summer of 2007 in a mudpond and were not harvested and looked at closely until the late Autumn. 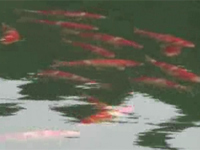 By early 2008 the males and females were separated and in the spring and summer of 2008 many of these Mako-Showa males were used as parent koi. We have been impressed with the body lines and growth of these Showa as well as the bolder sumi. We hoped that with the right matches we could bring those characteristics out in our Showa tosai of 2008/09. While it may be too early to tell how great these 2008 Mako Showas will be, we are sure that we are going in the right direction. Our goal to produce Showas that have both the coloration and body to compete at the highest level continues to motivate us. Mako Showa is just beginning. On November 16th, we will be holding our 3rd Annual Momotaro Koi Farm Koi Show. This event is a special thank you to our dealers and customers. The Koi for this Koi Show are from our May 2010 auction. These 60 koi; 20 Kohaku, 20 Sanke, and 20 Showa will be judged together with the champions and best in variety koi winning Bizen-yaki ceramic Pottery from the Isezaki family. Koi judging will begin at Noon and will be followed by awards presentation and dinner. There will be a nisai and tosai auction on the 17th of November. We started breeding from 15th of April. “Ryujin”, owned by Mr. Takigawa. The runner up champion and over 85cm class champion were also Momotaro bred Sankes owned by Mr.Takigawa. 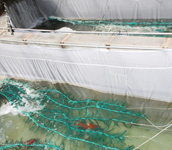 In addition, Momotaro Koi Farm supplied the top 3 koi in the over 85 cm division, as well as many other Izumo-awards, given to special non-gosanke variety koi. We would like to congratulate all the winners and especially Mr.Takigawa for his notable achievement. Other measure prize we won !! 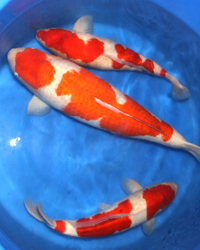 On October 3, 2008 Momotaro Koi Farm hosted a special Momotaro Koi Farm Koi Show for koi purchased at the May 2008 auction. This special event was a Thank You to all the customers and supporters who helped Momotaro Koi Farm get back to the top of the koi industry. The May 2008 auction fish were purchased as Tosai then all grown in the same indoor pond until the koi show event in October. 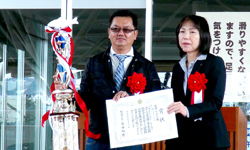 The koi show was judged by special guest Mayakawa Kiyoshi, and special awards were given out by Bizenyaki “Living National Treasure” Isezaki Jun, as well as Isezaki Shin, and Isezaki Kyo. 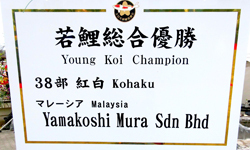 This Koi Show’s Champion was a Showa owned by Kepong Koi Farm in Malaysia. Mr.Takigawa’s many Grand Champions, and his second ZNA All Japan Show Champion bred by Momotaro Koi Farm. 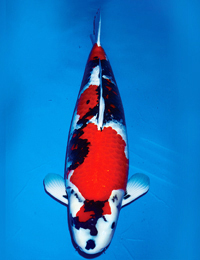 Click here to read an article highlighting the changes of Momotaro Koi Farm's 2007 ZNA Koi Show Koi. On November 10th and 11th of 2007, the Japanese ZNA Koi Club held its 43rd annual Koi Show in Ojiya City, Niigata Prefecture. 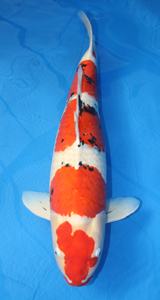 We are pleased to announce that a 105 cm Sanke bred here at Okayama Momotaro Koi Farm won Reserve Grand Champion award. This Sanke, owned by Mr. Takigawa of Shimane Prefecture, has reached this impressive size and is now only 8 years old. The Breeding and culling continues here at Momotaro Koi Farm. We have many Kohaku, Sanke, and Showa growing in our mudponds now. We also have produced Ginrin Sanke, GinRin Kohaku, Goshiki, and Kumonryu. We will begin selling koi in late September. We are now taking orders for tosai, Nisai and older koi now. Please continue checking our homepage for more updates. held in Belgium, attracted many visitors from all over Europe to see a great collection of top koi. We are happy to inform that a Momotaro Sanke owned by Mr. Giel Van Alphen of Vijvercentrum De Scheper, was awarded Supreme Champion. Congratulations to Mr. Van Alphen and also to Koi @ Home. 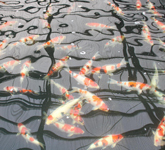 Please be sure to check our agents page to find where you can buy authentic Momotaro Koi, Koi Food, and Bacteria House filter media. 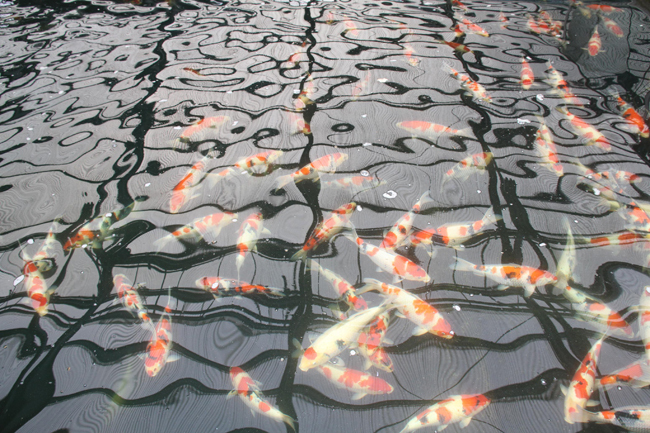 At Momotaro Koi Farm we work hard to make great koi. 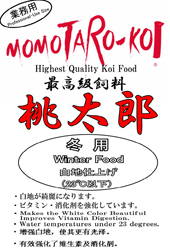 We have researched, use, and have confidence in Momotaro Koi Food, and Bacteria House Filter media. We stand behind these products and hope they will bring koi hobbiests enjoyable and satisfying koi keeping experiences. There are many places that sell fake products using the Momotaro name, but these cannot give the best results. 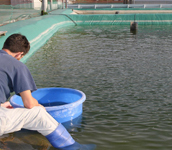 Please be sure that you are buying real Momotaro koi, koi foods, and Bacteria House filter media from our trusted Momotaro agents and dealers. 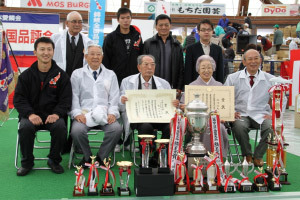 "Breeding Season 2007 Begins "
We would like to congratulate Mr. Mistuzo Kaneko of Nagano Prefecture for winning Young Champion at the 2007 Wakagoi Koi Show held in Niigata on April 21st and 22nd. 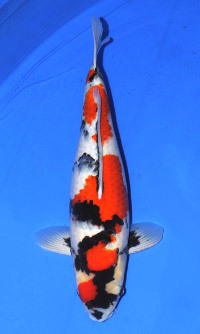 This koi is a 42cm Kohaku. Interestingly, this koi is a baby of another of Mr. Kaneko’s Momotaro Kohakus. Both koi have great futures ahead of them. 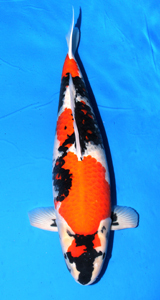 From 18th to 21st of January the Zen Nihon Shinkoukai held its 38th All Japan Koi Show in Tokyo. 75bu male Mr.Togo Kanakama and also won the 1st prize 70bu Tancho Max Koi Farm. 37th Shinkokai All Japan Combined Koi Show. Kokugyo prize. 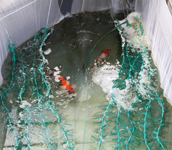 On January 20,21,and 22nd Momotaro Koi Farm exhibited koi in the 37th Shinkokai All Japan Combined Koi Show. the exhibition and sale were opened. At the same time, we have added the ponds for the baby fish year by year. >>Click here sorry.animation in preparation. Straight from Japan...For the Serious Hobbyist!